Bed size: We finally bought a king a few months ago, and it has been HEAVEN. Chore you hate: All of them, but especially cleaning the bathrooms. That’s the one thing D gets stuck with. Essential start of your day: Food. I wake up starving. Instruments I play: Clarinet and alto sax, although I haven’t touched either in years. I used to be very good though. Nicknames: None now. But all through school it was Spam. Not because I ate it or anything. Just because it rhymes with my name. So clever… But it stuck. I even had it on a personalized license plate in high school. Overnight hospital stays: Nope, never. Pet peeve: People who think they know more about my job than I do. Time you wake up: Through the week, 5:00 am. The weekends are determined by the dogs’ bladders. Rarely past 6:30. Underwear: Thongs, boyshorts, or commando. Depends on the activity and the outfit. Veg you dislike: Haven’t met one yet! What makes you run late: My husband, and it drives me bonkers. X-rays you have had done: Teeth, knee, and chest. Yummy food you make: Lasagna. Zoo, favorite animal: I disagree with animals being kept in captivity and displayed for human entertainment. Period. But I’m fascinated by elephants and think this place is just amazing. 1. I had to have the windshield in my Tahoe replaced Tuesday. When I was coming home on my lunch hour last Friday, a rock flew up and hit it and busted the crap out of it. No biggie. Insurance paid for all of it. But I have to admit I have been a little uneasy running on the highway ever since. If a rock does that to glass, what would it do to my noggin? 2. CEP did a promo last year offering a pair of free compression socks to anyone who sent in a picture of themselves wearing their socks while crossing the finish line of a RnR race. I wore them during the Vegas marathon, sent in a picture, and I got my snazzy new green CEP compression socks in the mail today! 3. So far so good with the food journaling. It has definitely made me more aware of what (and more importantly, how much) I’m eating. It’s interesting, too, to see that I’m pretty consistently falling just a tad short of my minimum daily protein needs. I had no idea. I have been cutting back on animal products, but I assumed I was getting enough protein elsewhere in my diet. I now know that I will have to be more deliberate about replacing those proteins. I’ve had to throw in a serving of nut butter the past couple of days just to hit the lower end of my daily requirement spectrum. Guess I’ll be stocking up on a variety of beans at the grocery this weekend. Guess I’ll also be figuring out something to do with this red quinoa that’s been in my cupboard for a couple of months (suggestions appreciated!). I’m determined to get about 8 pounds off. There’s no reason I can’t do it. I was starting to get just a little irritated because the scale just hasn’t been budging. It’s stuck at 133. Yeah, there are days when it’s 131 and days when it’s 135, but that’s normal for me. I want to take that down to the 123 to 127 range. These love handles gots to go. And food journaling is going to help me get it done. (Along with the fact that I just put it out there on the interwebs and will be filled with shame if I am forced to report anything but success.) I know I munch a lot, and I do most of it mindlessly, and actually having to log it in will make me more aware of what’s going into my body. Today is a fine example. I’ve logged in 302 calories worth of snacks so far today, and it’s not even 4:00 pm. And if I’m being completely honest, it would have been WAY more than that if I wasn’t logging them. It’s all those sneaky little calories that have been hiding in my diet and keeping me from reaching my goal. No more. I’m calling them out. 125 or bust. We had such big plans for 2011. We were gonna finish concreting the driveway. (It’s a fairly big drive. We did half of it already.) We were going to put in a new French door. We were going to pay extra towards a loan to have it paid off by the end of the year (three years early). We were going to take some trips. Then we had our taxes done yesterday. And since I hear jail isn’t all that fun, rather of doing all those fun things we will be paying the IRS a disgusting amount of money instead. We’ll be living like the poor folk for a while because… well, because we’ll BE the poor folk for a while. 1. I made hotel reservations yesterday for a girl’s weekend for me and my sister! We’re going to Nashville the last weekend in April and I CAN. 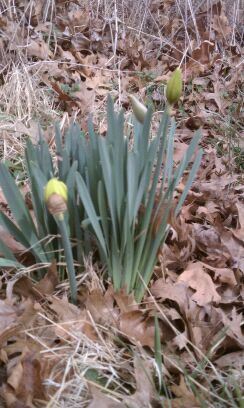 NOT WAIT!!! Coincidentally (or maybe not…), that’s the weekend of the CMM. I’m excited to go and spectate! I ran the 1/2 last year and it was awesome, but I’m already running two April HMs, so I just want to cheer everyone on in Nashville. I don’t know anyone who is running it this year, so if you are, HOLLA! I’ll cheer for you specifically. 🙂 I even thought about hanging out around the 20+ mile mark and running with various random struggling marathoners for a little bit. I know that would have helped my morale IMMENSELY when I was running mine solo in December. Other than that, I don’t know what else the weekend will involve. Besides The Melting Pot. Definitely The Melting Pot. And band-stalking on Second. And beer. 2. I got this in the mail Tuesday. 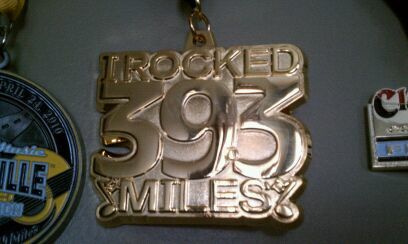 It’s my Heavy Medal medal for completing two Rock N Roll events in 2010 (CMM 1/2 and RnR Las Vegas Marathon). It’s pretty cheesey, no? That’s okay. It still looks cool on my medal hanger! 3. 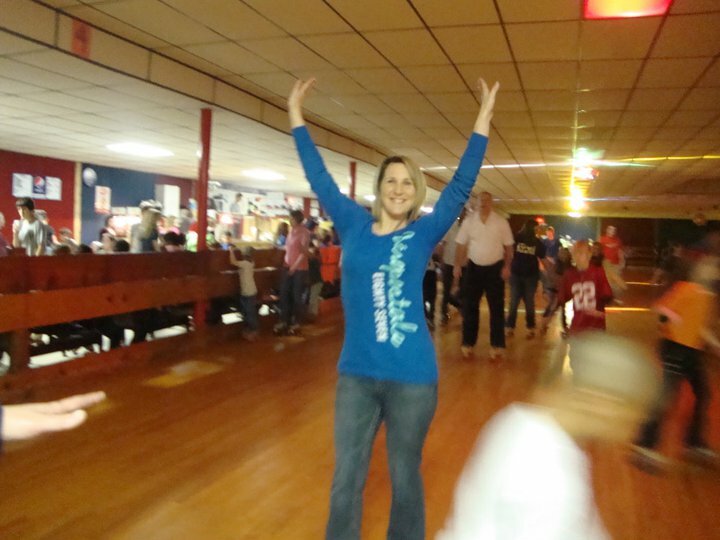 I had the brilliant idea to go roller skating this past Sunday with some peeps from church. I haven’t had wheels on these feet in like 20 years. I sucked at it then, and guess what! I still do! I didn’t even want to go out onto the rink because it was sooooo crowded, but the kids that I was with finally shamed me into it. It was scary! The people zooming past me like I was standing still (a stand-still actually isn’t much slower than I was going) made me nervous, and there were kids falling all over the place. I was scared to death one was going to fall in front of me and I wouldn’t be able to stop before I rolled over them. But they finally got me out there and I didn’t fall once. I had several close calls though. Celebrating my fall-less first lap. This photo is weird. It makes me look like I have dark roots and no hair on the right side of my head. And that looks like a ghost in front of me. ‘Twas a beautiful February day! A great day for a 5K. This was Murray’s first year to host the nationwide event. I always expect a fair amount of disorganization with an inaugural event, but that proved not to be the case with this race. I got to the park yesterday morning with just enough time to pick up my race packet, get my bib on, stretch a little bit, and walk to the starting area. I was glad for the good timing to minimize the waiting-around-in-the-cold time. It was a pretty nippy 31 degrees with a cold wind. The race was supposed to start at 9:00. At 9:00 they called the runners to the start line, and then we stood there for 6 minutes through the “We’d like to thank…” speech. At 9:06, they blew the air horn (a step up from the verbal “GO!” from my last race!) and we went! It didn’t take me long to realize I had forgotten to do something. I forgot to change the pace alerts on my Garmin. I had it set to alert me at anything slower than an 11 min/mile or anything faster than a 9 min/mile. Dangit. I had to listen to 3.15 miles of Garmin telling me to slow down. Ugh. I’m sure my fellows racers loved me too. But I wasn’t about to stop and fix it. The first 0.75 miles or so were all out in the open, and the sun had fully melted all of the ice and snow that we’ve gotten over the past week. Then we hit the tree-lined residential areas, and there were some pretty tricky spots to maneuver there. I lost a few seconds side-stepping around and tip-toeing across some lingering ice patches. It made it impossible to run the tangents in some places, leading to an extra 0.05 mile over the course. I wasn’t sure what to expect with regard to the terrain of the course, but there were no real surprises. Just some minor hills. Mile 2 was the most difficult and felt like my slowest (which turned out not to be true). The majority of it was a looooooong, gradual uphill. There was one short, steep part but then it leveled off to a lower more manageable grade. It was a good thing there were so many volunteers pointing us in the right directions. We were turning here and there and I had no idea where we were anymore. I was beginning to think they were taking us all snipe hunting. We finally turned a corner and I saw familiar scenery. The last part of the race was a retrace of the first part leading back into the park. I was still feeling pretty strong, and it was really looking like I was going to hit my goal of 28:00. I kept pushing and in the last stretch I noticed that a girl that I had passed earlier in the race was trying to chick me! Aw, hell naw!!! It was a two-man race to the finish. I had no idea who crossed first, but I heard the guy at the finish line yell “Purple, blue!” to the girl taking the tags off our bibs. I was wearing the purple shirt, and she was wearing blue. I got her! HA! Garmin showed my fastest time during that last 0.15 to be 5:45. Yeah. I don’t run that fast. Stupid me, I didn’t even look at the clock as I was crossing the line, and I forgot to stop my Garmin (AGAIN!) until after I’d gotten water and decided that my lungs were NOT going to come flying out of my nose. I asked the girl that crossed with me if she noticed the time, and she said the last number she saw was 27:59.88. I was thrilled that I got my 28:00. I actually would have been happy with anything faster than my PR of 28:38 from last month, but I had my heart set on 28:00. I was at the race by myself, and so was the girl that I finished neck-and-neck with, and we ended up hanging out and chatting. After the last 5K finisher came in, they were holding a one-mile fun run, and we decided to bandit that too just to warm ourselves back up. It was sunny and 40ish by that point, but it still felt chilly from being all sweaty with the wind blowing. Then it was time for the awards ceremony. I didn’t know if I had come anywhere near placing or not, but I was hoping. Turns out they didn’t go three deep in the AG awards. Instead they awarded overall female, overall male, and the top spot in each age group, and that was it. The overall female winner also took first place in my age group. I didn’t think most races did that? I thought if you won overall, you didn’t get the AG award? This has turned out to be a pretty key detail. Why? Because they posted the official results online, and I was SECOND IN MY AGE GROUP! If the first-place girl had been taken out of the running since she was the overall female winner, that would have been ME taking that medal home! Just my luck! Oh, and the official results show a finish time for me of 28:00.95. DOH! That’s okay. I’ll take a 28:01. Still a 37-second PR. I’ll get it next month! 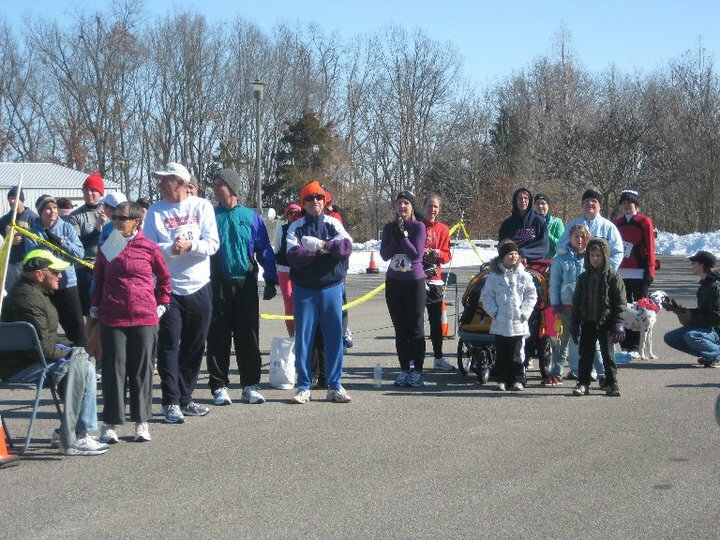 That’s me in the center, in the purple and black with bib #24. The newspaper in my small town is pretty ridiculous. Rarely is their front page story anything that is even remotely newsworthy. Yesterday was no exception, but I did get a good laugh out of it. 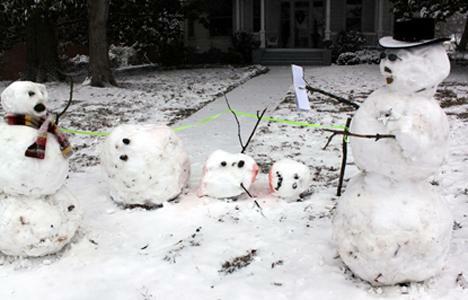 John W______ and sons Austin, 10, and Alex, 12, built a huge snowman Monday afternoon in their front yard at the corner of D____ and H___ streets. During the night, however, vandals knocked it down. Mom Leigh W______ said instead of getting angry, the three turned the remains into a crime scene, complete with a law enforcement officer (right) questioning a suspect (left) while the victim (center) is cordoned off by green crime scene tape. 1. I told you guys that I came in fourth place in my age group at the Race on the Trace a couple of weeks ago. I was wrong. That’s what the board said when I left, but apparently someone else hadn’t yet turned in their card. The official results posted on the web site shows me in 5th place, 21 seconds behind the girl who I thought had taken 3rd place. 2. I’m going into Saturday’s 5K with VERY rested legs. (That’s the positive spin I’m trying to put on the fact I’ve hardly run this week.) Thanks to the crazy amount of snow and ice we’ve gotten, I have missed a lot of workouts and a lot of miles. 3. I’ve had a hard time deciding between two half-marathons in April. The one in Jackson on the 9th or the one in Murray on the 16th. Screw it. I’m doing them both! I just had a post all written up. It was called Tuesday Tirade. In it, I bitched and ranted and whined about how crappy my day was yesterday, I cursed my job, I bashed my husband, and I basically just laid it all out there about how miserable I am. And I immediately deleted it. Nobody wants to hear that crap. I’ve seen a few posts lately about how journaling is supposed to make you feel better. It didn’t work. It just made me feel stuff again. And I’m not a fan of emotions. So I’ll just wrap all that junk up in a neat little box and cram it back deep down inside where it belongs. If you don’t feel it, fake it.